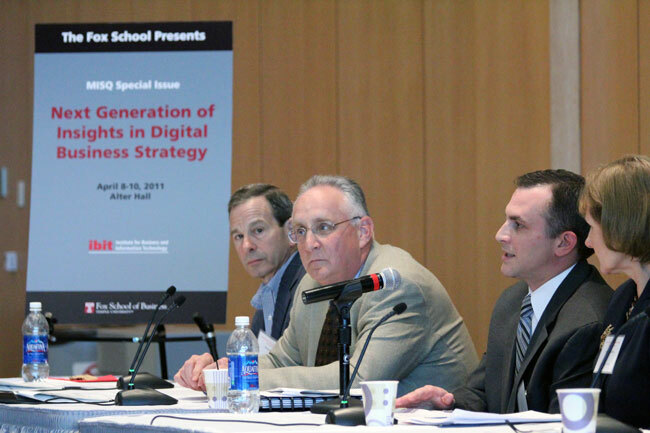 On Monday May 21, 2012, the Institute for Business & Information Technology (IBIT) hosted a University-wide symposium on “Big Data” in cooperation with the Office of Research. 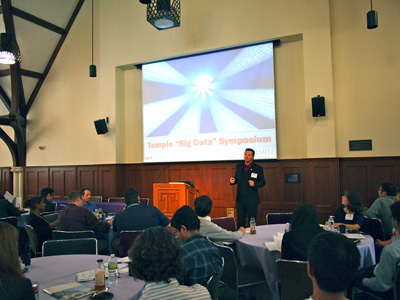 The purpose of this symposium was to bring together Temple researchers across disciplines to explore inter-disciplinary synergies and collaborations on big data research. Big data refer to extremely large datasets that do not conform to traditional principles of data collection, storage, management, sharing, processing, and statistical analysis, and they impose challenges on data storing, computer processing, existing statistical data analysis approaches, and existing ways to interpret, visualize, and derive knowledge from huge quantities of data. 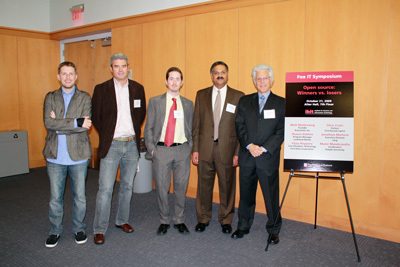 Over 70 faculty and PhD students attended the symposium that included several presentations and panel discussions from faculty in statistics, computer science, MIS, marketing, and the school of medicine. 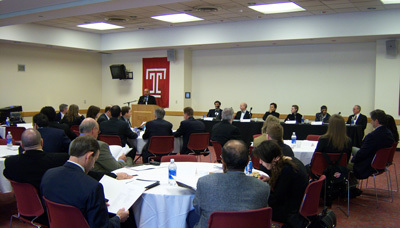 The purpose of this internal Temple symposium is to identify capabilities on how to deal with big data across campus, identify synergies across researchers, Centers, departments, and schools, and hopefully spawn inter-disciplinary collaborative research on big data that will pursue external funding. Notably, the U.S. government has recently unveiled a $200M effort titled “Big Data Research and Development Initiative” that aims to support new R&D initiatives associated with big data. Moreover, the symposium will explore inter-disciplinary collaborations for potentially developing graduate programs in data analytics. 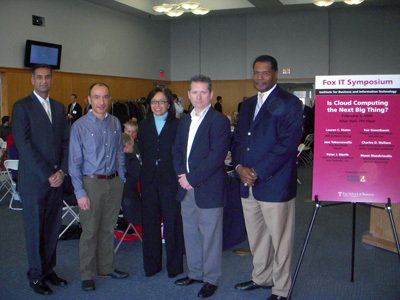 The Fox School’s Institute for Business and Information Technology in collaboration with the Special Issue on Digital Business Strategy of Management Information Systems Quarterly (MISQ) presents the Fox IT symposium: CIO 2.0: Next generation of insights on digital business strategy. The symposium will integrate different points of views on how IT shapes and influences business strategy. As exponential advances in the price/performance of computing, storage, bandwidth, and software applications drive the next generation of digital technologies, it is time to rethink the role of IT strategy, from functional-level strategy aligned, but subordinate to business strategy, to a fusion between IT strategy and business strategy termed digital business strategy. The symposium will discuss how next-generation CIOs can take advantage of their deep knowledge of digital technology to take a leadership role in their firm’s formulation of business strategy. The philosophical debates continue, the political positions for and against are now well known. The predictions of early demise or swift success were both wrong. Amid all these debates, an increasing number of new innovative applications are being released as open source and the business case seems much simpler today. Terms such as peer production, innovation, reliable, and high quality are now frequently associated with open source projects. In this symposium we will take a pragmatic perspective on open source concepts and tools. What can your firm do today? Should your next internal project leverage open source toolkits? Should you release your internally developed tool to the open source community? Should you deploy open source technologies? Are there really any cost savings? Is there an appropriate mix of approaches that can leverage the gains of open source without incurring the risk? What are the standout examples of today and tomorrow? What are the keys metrics of success and why do certain projects fail? The symposium will bring together a diverse panel of experts who will ensure that your organization does not miss the boat on this important topic. Matt Mullenweg, Founder, Automattic Inc.
To critics, cloud computing is just a fancy name for distributed or net-centric computing. For proponents, it is a concept that will usher in a new era of high value computing innovations at low cost. Cloud computing is typically associated with delivering services through the Internet and is integrated with the concept of software as a service (SaaS). Google Apps and application service providers (ASPs) such as salesforce.com are often quoted as examples. Cloud computing will likely leverage massive data and storage centers, provide services on a subscription basis, apply virtualization, and provide instant access worldwide through the “cloud.” Is cloud computing in general and software as a service specifically, the answer to the economic uncertainties of today? Will firms large and small really be able to reduce their reliance on internal server farms and utilize Amazon’s web services? Will we see new applications that for example leverage the Facebook API to deliver entirely new kinds of capabilities? Can cloud computing overcome security and integration challenges and help firms save money and deliver new capabilities? Ed Sullivan, CEO and Founder, Aria Systems, Inc.
Yair Greenbaum, Executive Vice President, ekkoTV, Inc. Organizations often talk about innovation, but few actually act in an innovative manner. Is innovation really that important or is it just the modern mantra of every organization? Why do organizations really need to innovate? Is it competitive or opportunistic pressure? Are some organizations born to innovate? Can every organization really create new products and service through innovation? Should every organization pursue radical innovation? Would it make more sense to pursue process innovations under some conditions? Can you really innovate by acquisition or must you develop everything on your own? Is open and distributed innovation really the answer? Should large organizations even bother with innovation? Can you simply buy innovation? Is innovation really the old refrain of business process reengineering? The panel will engage the participants in an informal interactive manner to further discuss the above questions. Cristóbal I. Conde, President and CEO, SunGard Data Systems Inc.
Matthew Charles Mullenweg, Founder, Chief BBQ Taste Tester, Automattic, Inc.